With a mortar and pestle, rub saffron threads and one teaspoon of sugar together and set aside. Heat the milk to lukewarm, about 37 °C (99 ° F), and add the melted butter along with the saffron-sugar mixture. Crumble the yeast in a bowl and pour about 1/4 cup of the warm saffron milk on top and stir gently. Sprinkle with 1 Tablespoon sugar and 1/8 teaspoon salt and let rest five minutes. Add the remainder of the sugar, the milk, 3 cups of flour and the beaten egg and stir with a wooden spoon. Sprinkle 1/4 cup of flour on top and knead dough in the bowl for several minutes, adding more flour if the dough is too sticky to handle. Turn dough out onto a floured board and knead for 5 to 10 minutes, adding flour as needed to keep the dough from sticking. 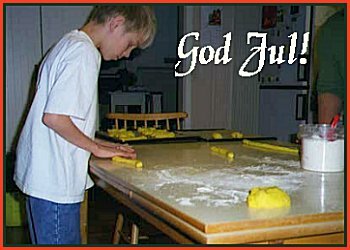 Divide the dough into small pieces and, using your hands, roll the dough bits into an S or other traditional Lucia shape. Push raisins into dough as desired for decoration. Place buns on a cookie sheet that has been buttered or covered in parchment paper. Cover buns with a clean cloth and let rise again until double in size, about 30 minutes. Preheat oven to 225 °C (425 °F). Make the glaze by beating one egg with 3 Tablespoons milk. Brush the tops of the buns with the glaze just prior to baking. Bake 5 to 10 minutes; cool on a rack. There are a number of traditional shapes for Lucia buns; my three favorites are the boy (no 2), the simple cat (no 1) with a raisin in the center of each loop and the double cat or golden wagon (no 3). A common large form is the wreath. There are several ways to make one. This is a plaited wreath: Divide the dough into 3 equal parts and roll them out into 24" long rolls. Start plaiting from the middle. Alternately put the right and left roll over the middle roll. Finish the other half alternately putting the right and left roll under the middle roll. Tuck in the ends and let rise. Glaze with egg-milk before putting them in the oven. Saffron buns gets dry very easily. For this reason, always freeze them as soon as they are cold. Bring out only the number you will use on the same day. They are delicious when defrosted in the microwave oven and served hot. To get an even stronger saffron flavour and colour you can crush the saffron and then mix it with the fat. Let it stand for a couple of hours. This way the fat brings out more of the saffron flavour. Use only saffron of the highest quality you can afford. Stir the yeast in a small amount of the liquid. Mix beer, yeast and salt with 11 decilitres of the flour. Knead the dough well and let it rise under a towel unto double size. Let butter, molasses and spices come to a boil - let the mixture cool. Pour the mixture in the dough and add raisins. Knead the dough until soft and flexible, add more flour in portions. Sprinkle with flour and cover with a towel. Put the dough on a floured bakingtable and knead well. Cut into two pieces, shape each piece into a loaf. Place into two greased loaf tins. Let rise for further 30 minutes. Turn loaves out of tins on to a wire to cool. It is this kind of bread we mostly use for "dopp i grytan". "Dopp i grytan" a traditional Swedish Christmas dish. Broth, from the cooking of ham or sausage, is condensed and put on the stove. Then you hastily dip slices of wortbread in the broth and eat that e.g. with some of the meat dishes of the smorgasbord. In Norrland they used thin unleavened bread but otherwise the procedure was the same. I our family we don't have that dish any longer, but when we were children we liked it. Stir the yeast in a small amount of the liquor. Add the remaining liquor, salt, rye flour and most of the wheat flour. Knead to a flexible dough, cover with a towel and let rise for ca one hour. Knead the dough lightly on the floured baking table, if needed add som more flour. Spare e bit of the dough for the decorating. Shape the rest into a round big cake, put it onto a baking sheet. Divide the remaining dough into nine parts. Roll eight of them to small lengths and shape a small round cake ot the ninth. Put the lengths on top of the cake like the spokes in a wheel and roll the endings. Put the small cake hiding the joints in the middle. Cover the cake and let it rise for 20-25 minutes. Bake in oven 200 ° C (=400F) near the bottom of the oven for about 50 minutes. Divide the dough into twelve parts, make four twisted loaves. Interesting to know: At Christmas in old times they they made a big decorated bread as a decoration for the Christmas table. After Christmas that was put in the corn bin until seeding time at spring. Thus the name "Såkaka" that is seed cake.